The CNV Scrubber is designed to show users the genetic location and frequency of every copy number variant contained in the SFARI Gene database. CNVs are mapped according to the chromosomes in which they've been identified. Filters can be used to differentiate CNVs caused by deletion from those caused by duplication, and the width of the bars designates the average base pair length of identified CNVs in a particular band. As more CNVs are identified and added to SFARI Gene, they will be seamlessly integrated into this tool. The data on CNVs are presented along two parallel axes. 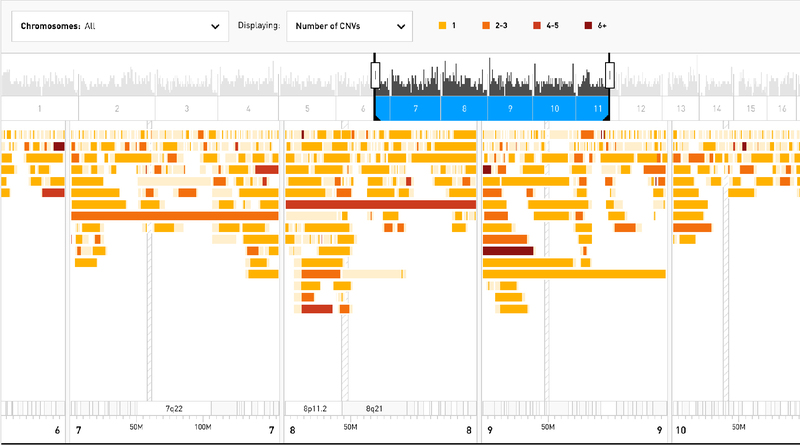 The sliding scrubber on top uses vertical bars to show the number of CNVs at each location in every chromosome, while the larger window below uses horizontal bars to illustrate the number of overlapping CNVs at every locus. 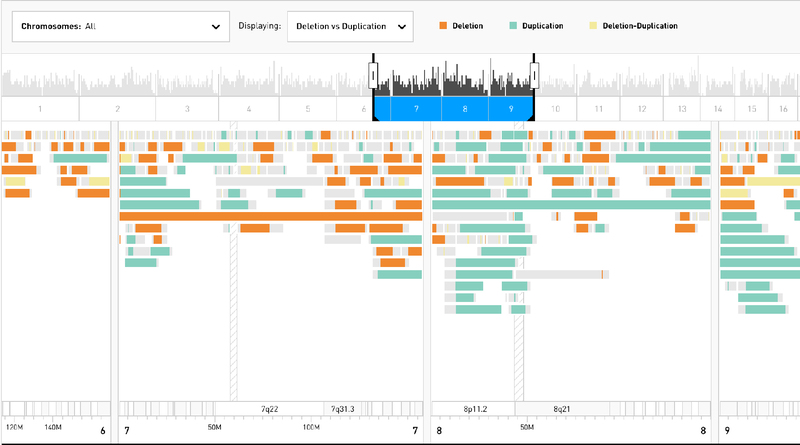 This dual functionality gives users both a broad overview of the most common genetic locations of CNVs and a more in-depth look at the size and frequency of individual CNVs and whether they are attributed to duplication or deletion. Copy number variation is caused by either the duplication or deletion of a gene segment within a given chromosome. In many cases, however, deletions and duplications can be found at the same locus. The CNV Scrubber uses a color gradient to represent the instances in which a CNV has been attributed to both deletion and duplication. The data available in the CNV Scrubber can be filtered by the number of studies that identify each CNV. 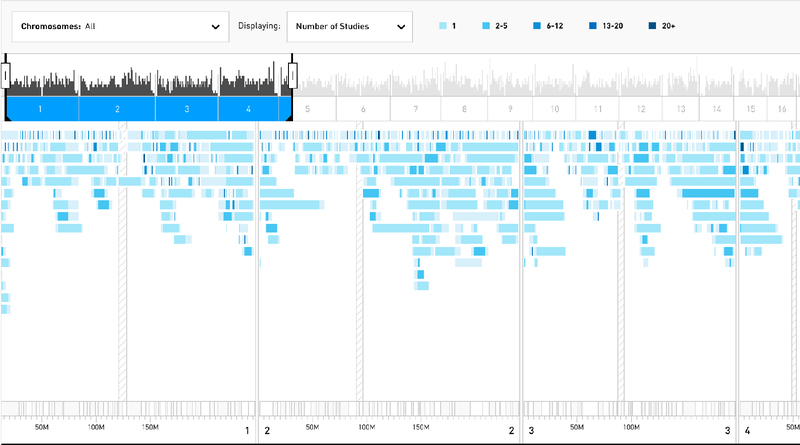 This feature will help users determine, at a glance, the relative frequency of ASD-implicated CNVs found in a particular location. Users can also filter their results to highlight the number of individual CNVs found at each location. As the number of CNVs identified in a study can vary greatly, this filter gives users an accurate representation of the individual CNVs that have been catalogued in the database, regardless of how frequently or infrequently they've been cited in published research.